This design is avaliable as a magnet, water skimmer necklace or a hand carved stone piece. I always tell the purchasers of my wall art to interpret the design for themselves. I know when I am carving each piece the stone and design speak to me in new and different ways, even if it is a design I have carved many times. Somehow the stone and design come together to give me a unique carving experience as well as a one of a kind wall hanging once the art work is complete. There is however normally a common meaning and some history behind the designs I carve. Here is a little background on the design known as Kokopelli or the humpbacked flute player. Kokopelli carvings are in evidence as early as the basketmaker period approximately beginning A.D. 500 through the Spanish entry into the southwest around the middle of the sixteenth century. His depictions follow the Anasazi migration throughout the southwest and to a lesser extent the settlement patterns of the Mogollon, Hohokam and Fremont peoples. Kokopelli stone carvings are found primarily in canyons, on mesa tops and beside rivers frequently located close to habitation sites. Generally the four corners area, Colorado, Arizona, Utah and New Mexico are the settlement areas where these habitation sites are located. A few attributes that are common to most Kokopelli carvings are his humpback, flute and his head adornment. The earlier carvings are more likely not to have all three common attributes. There are depictions without the hump or head adornment but the flute seem to be the most prevalent to all carvings. What are the possible meanings of these adornments? The flute is known to be used in sacred rituals, courtship ceremonies and celebrations of the ancient ones and even in current day existence. It is also used as a signaling device to announce a trader’s arrival. Kokopelli has been thought to use his flute to summon the rain or even melt the snow and bring on the spring. Playing the flute is also a way to communicate either with the living or the spiritual world. There is one school of thought that Kokopelli’s hump might be an indication of a abnormality or the late stages of a crippling disease. More likely it could be depiction of a burden basket often carried on the back and anchored with a support across the forehead of the bearer. These baskets were normally carried by females all though they are heavily associated with kachinas and mythical beings. Could it be that it was a burden basket filled with goods to trade or seeds to plant? Head adornments have long been associated with shamans, spiritual being, warriors and usually people of great importance whom hold a high position in their society. Could Kokopelli’s adornment be showing the position he held or was he thought of as a god like figure? 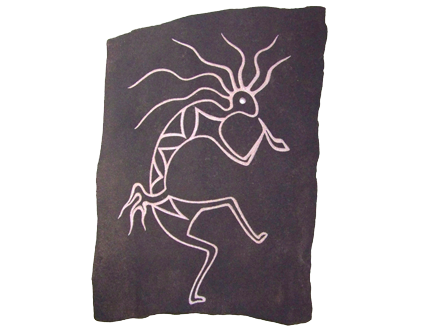 I feel kokopelli most likely began as trader that traveled between villages and tribes. Playing the flute would be a perfect way to break the ice, as it were, and be accepted into a new group. He traveled far and wide trading goods, seeds, and even cultural habits between the different peoples. Were ever he traveled there were probably celebrations and he was sure to be thought of as bringer of good will and prosperity. As his legend grew I am sure he began to hold more of a mythical quality and just the mention of his name could invoke those positive attributes. Ron White, stone carver and entrepreneur, has been carving stone since 1993, and is shown in more than 40 galleries across the US. Prior to beginning his work with stone carving Ron has worked extensively with leather, wood cabinetry and even jewelry. Learn more about Ron White and his work at www.derivedfromnature.com. This article was published on Saturday 20 November, 2010.